The European Union (EU) is currently on track to meet its renewable energy target, i.e. that 20 % of its energy should come from renewable sources by 2020. The share of energy from renewable sources in the EU’s gross final energy consumption reached 16.0 % in 2014. 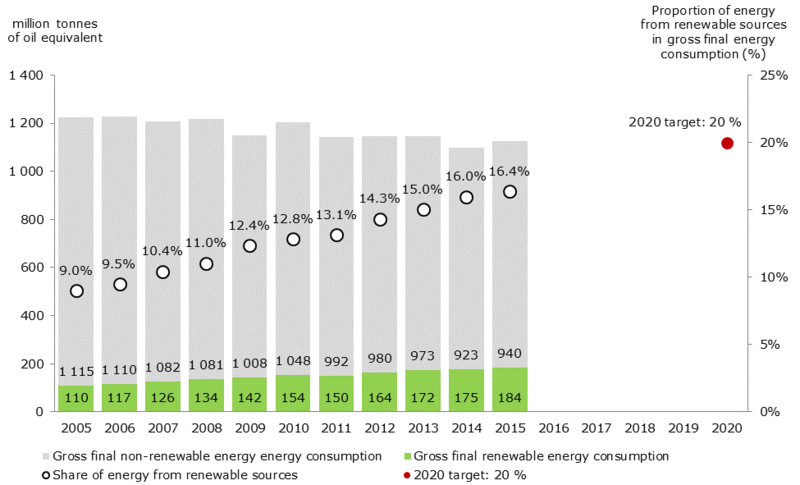 For the two-year period from 2013 to 2014, the average consumption of renewable energy as a proportion of gross final energy consumption exceeded the level of the indicative trajectory set out in the Renewable Energy Directive (RED). This good progress at the EU level is confirmed by preliminary estimates from the European Environment Agency (EEA), which show that renewable energy use in the EU increased to 16.4 % of gross final energy consumption in 2015. As regards the consumption of renewable energy in the transport sector, the EU reached a share of 5.9 % in 2014 (and 6.0 % in 2015 according to EEA preliminary estimates). This indicates that insufficient progress has been achieved so far towards the 10 % target for the transport sector for 2020. 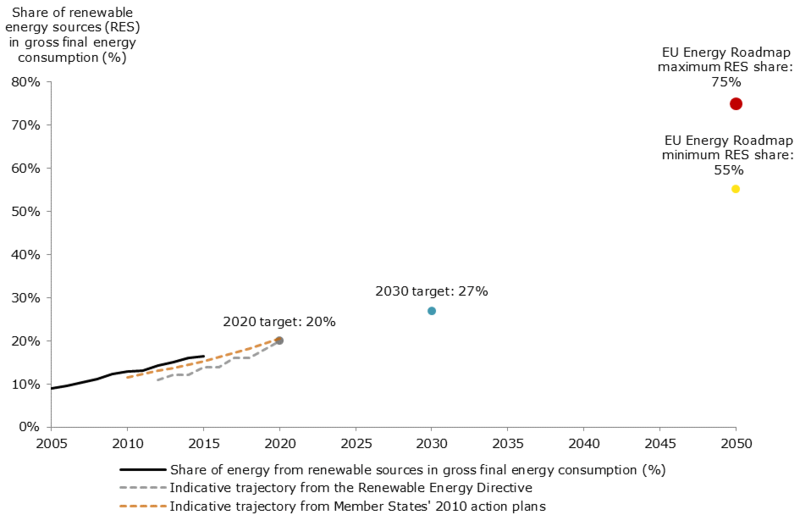 If renewable energy use as a proportion of gross final energy consumption continues to grow at the same pace until 2030, the EU will exceed the 27 % minimum target for 2030. However, this may not happen without additional efforts, because a number of regulatory changes have already affected investors’ confidence in renewables, and market barriers and fragmentation still represent challenges for new entrants. In view of the EU’s longer term energy and decarbonisation objectives for 2050, the speed with which the EU deploys RESs will need to increase. The European Union (EU) is currently on track to meet its target of reaching, by 2020, a 20 % share of energy from renewable energy in its gross final energy consumption . In 2014, the use of renewable energy sources (RESs) in the EU, as a proportion of gross final energy consumption, continued its steady growth, standing at 16.0 % of gross final energy consumption. This is an increase of one percentage point from the previous year. According to preliminary estimates from the European Environment Agency (EEA), the share of energy from renewable sources in the EU’s gross final consumption of energy continued to increase in 2015, reaching a level of 16.4 %. The Renewable Energy Directive (RED) sets national targets for 2020 for all Member States (EU, 2009). These national targets, ranging from 10 % for Malta to 49 % for Sweden, reflect differing national circumstances and starting points. To ensure that these 2020 targets are achieved, the RED also sets indicative trajectories for the period between 2011 and 2020. Member States may reach their indicative RED targets domestically (by establishing adequate RES support measures) and through cooperation with other countries (between local, regional and national authorities; planned statistical transfers; or joint projects). The average RES share of 15.5 % achieved in the EU over the two-year period from 2013 to 2014 exceeded the average share from the indicative trajectory for these two consecutive years, as set in the RED (12.1 %). It also exceeded the indicative average share of 13.8 % set for the 2015–2016 period. Moreover, the RES share of 16.0 % in 2014 was also higher than the level that Member States had planned to achieve by 2014 and 2015 (14.5 % and 15.3 %, respectively), according to the roadmaps reported in their 2010 national renewable energy action plans (NREAPs). Between 2005 and 2014, the use of energy from renewable sources, as a proportion of gross final energy consumption, increased by, on average, 0.8 percentage point every year. This steady increase reflects a combination of two trends: dynamic developments in the use of renewable energy (in absolute terms), together with a decrease in final energy consumption. While the consumption of renewable energy grew by more than 59 % between 2005 and 2014, total final energy consumption decreased by 10 % during the same period (see Figure 4.1). Between 2013 and 2014, the consumption of renewable energy increased by 3 Mtoe (from 172 Mtoe to 175 Mtoe), while the consumption of non-renewable sources fell from 973 Mtoe to 923 Mtoe. The 17 % decrease in the gross final energy consumption of non-renewable sources between 2005 and 2014 clearly indicates a progressive substitution of fossil fuels by renewables. Note: Eurostat calculates the shares of RES consumption and as part of this process normalises wind power and hydroelectricity generation, which are part of the RES share numerator. However, the total consumption of electricity included in the denominator is not normalised. In the figure above, non-normalised gross final energy consumption is displayed together with shares of RES consumption in which the numerator has been normalised. The 2015 data are approximated estimates from the EEA. Source: EU, 2009; Eurostat, 2016; EEA, forthcoming. If the average annual increase in RES share observed between 2005 and 2014 is maintained until 2020, the EU will achieve its 2020 target. This, however, may prove challenging, because of recent changes in national RES supporting policies, and persisting market barriers for new projects. Other complex factors are also at play, with uncertain outcomes. In particular, relatively low-priced RES development options are becoming scarcer as the easiest and least expensive options are gradually being exhausted. At the same time, costs for new RES capacity are being reduced through economies of scale, better knowledge integration and increasing experience. According to their 2010 action plans and biennial progress reports , Member States plan to increase the share of energy from renewable sources at EU level to approximately 21 % by 2020. However, not all Member States reported RES projections, or specified the status of the policies and measures (e.g. existing or planned) on which their projections were based. This makes it difficult to use the RES projections to assess progress towards RES targets for all Member States in a consistent manner, as is done for GHG emissions. Furthermore, NREAPs and current RES projections do not reflect the recently endorsed objective to increase the EU-wide share of RES consumption to a minimum of 27 % by 2030. In this respect, current national documents offer limited information regarding the continuation of efforts foreseen by countries after 2020. The European Commission is expected to make a proposal for a revised RED in December 2016. Beyond 2030, the EU has no quantified target for renewable energy. However, in order to achieve the goal of reducing EU-wide GHG emissions by 80–95 % below 1990 levels by 2050, the share of RES in the EU will need to increase significantly, to levels of between 55 % and 75 % of gross final energy consumption by 2050 (see Figure 4.2), in accordance with the decarbonisation scenarios presented in the European Commission’s communicationEnergy Roadmap 2050(EC, 2011a and 2011b). Achieving such a high proportion of RES consumption calls for considerably higher efforts post 2030, as the required pace of RES growth would have to be up to three times that achieved between 2005 and 2014. A higher penetration of renewables before 2030 would balance the pace of growth required before 2050, but further policy efforts and investments would be required in the short term. The transport sector represents one particular challenge. Because of its significant reliance on fossil fuel-based technologies and infrastructures, progress in developing the use of renewable energy and reducing GHG emissions in this sector has been relatively limited in the EU to date (see section 3.4). Source: EC, 2011b, 2013a and 2013b; EU, 2009; EEA, 2011 and forthcoming; Eurostat, 2016. RESs are used in power generation, the heating and cooling sector, and the transport sector. In addition to the overall 20 % target for renewable energy use in all sectors by 2020, a 10 % target must also be achieved specifically in the transport sector, by all Member States. However, progress in this sector is much slower than if all sectors are considered together. Between 2005 and 2014, with regard to electricity consumed in the EU, the RES share grew at an average of 1.4 percentage points per year. In 2014, more than 27 % of the electricity consumed in the EU was generated from renewables, with about 41 % of that from variable renewable electricity (wind and solar power). For 2015, EEA estimates indicate that more than 28 % of total electricity consumed was derived from RESs, with more than 42 % of this from wind and solar power (EEA, forthcoming). 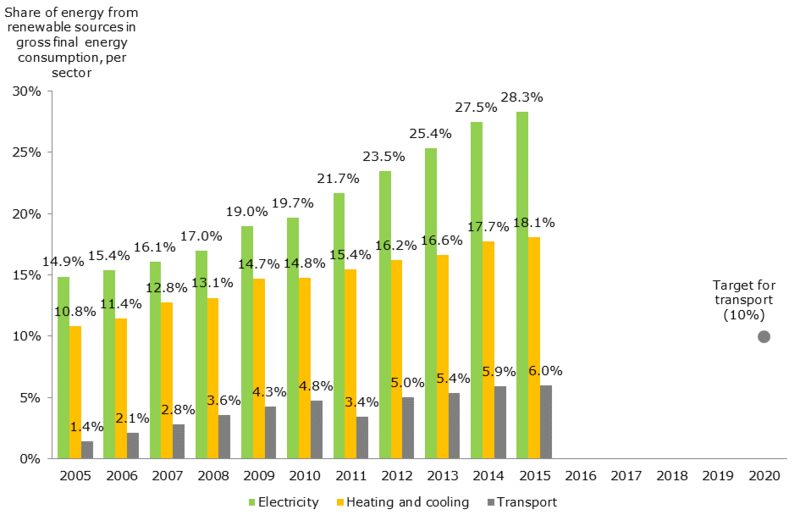 In the EU heating and cooling sector, the RES share grew on average by 0.8 percentage points per year between 2005 and 2014. The share of energy from renewable sources used in this sector amounted to 17.7 % in 2014, and was estimated to have been 18 % in 2015 (EEA, forthcoming). Heating from RESs is increasingly being used as a cost-efficient and secure alternative to fossil fuels (mainly natural gas) in Member States for district heating and at local levels. The legal framework concerning energy from biofuels produced from crops grown on agricultural land primarily for energy purposes remained uncertain until a political agreement was reached in 2012. A cap on the use of these fuels was adopted in 2015: such fuels should account for a maximum of 7 % of final energy consumption in transport by 2020 (EU, 2015a and 2015b). In 2017, each Member State will need to set a national target for advanced biofuels (e.g. fuels made from waste or algae). The use of biofuels to reduce GHG emissions remains a relatively high-cost option. For example, it is estimated (not considering the indirect emissions related to land use change) that the mitigation costs of biodiesel would be in the range of EUR 100 to EUR 330 per avoided tonne of carbon dioxide (CO2); for bioethanol fuels from sugars and straw, costs would range from EUR 100 to EUR 200 per tonne of avoided CO2 (JRC, 2015). Note: Percentages indicate the share of energy from renewable sources in gross final energy consumption of the corresponding sector. The 2015 data are approximated estimates from the EEA. Gross final energy consumption represents the energy delivered to end users (industry, transport, households, services including public services, agriculture, forestry and fisheries), as well as the consumption of electricity and heat by the energy sector for electricity and heat production. It also includes losses of electricity and heat during distribution and transmission. For the years up to 2020, Member States have to report, in their RED progress reports, the estimated excess/deficit production of energy from renewable sources relative to their national indicative RED trajectory. EC, 2011a, Energy Roadmap 2050, Communication from the Commission to the European Parliament, the Council, the European Economic and Social Committee and the Committee of the Regions COM(2011) 885, European Commission (http://eur-lex.europa.eu/legal-content/EN/TXT/?uri=CELEX:52011DC0885) accessed 14 October 2016. EC, 2011b, Impact assessment accompanying the document ‘Communication from the Commission to the Council, the European Parliament, the European Economic and Social Committee and the Committee of the Regions “Energy roadmap 2050”, Commission Staff Working Paper SEC(2011) 1565 (http://eur-lex.europa.eu/legal-content/EN/TXT/?uri=CELEX:52011SC1565) accessed 14 October 2016. EC, 2013a, EU energy, transport and GHG emissions: Trends to 2050, European Commission (http://ec.europa.eu/transport/media/publications/doc/trends-to-2050-update-2013.pdf) accessed 27 May 2015. EC, 2013b, ‘National action plans’, European Commission (http://ec.europa.eu/energy/renewables/action_plan_en.htm) accessed 14 October 2016. EU, 2009, Directive 2009/28/EC of the European Parliament and of the Council of 23 April 2009 on the promotion of the use of energy from renewable sources and amending and subsequently repealing Directives 2001/77/EC and 2003/30/EC (OJ L 140, 5.6.2009, p. 16) (http://data.europa.eu/eli/dir/2009/28/oj) accessed 15 August 2014. EU, 2015a, Council Directive (EU) 2015/652 of 20 April 2015 laying down calculation methods and reporting requirements pursuant to Directive 98/70/EC of the European Parliament and of the Council relating to the quality of petrol and diesel fuels (OJ L L 107/26, 20.04.2015) (http://data.europa.eu/eli/dir/2015/652/oj) accessed 14 October 2016. EU, 2015b, Directive (EU) 2015/1513 of the European Parliament and of the Council of 9 September 2015 amending Directive 98/70/EC relating to the quality of petrol and diesel fuels and amending Directive 2009/28/EC on the promotion of the use of energy from renewable sources (OJ L L 239/1, 09.09.2015) (http://eur-lex.europa.eu/eli/dir/2015/1513/oj) accessed 14 October 2016. JRC, 2015, The impact of biofuels on transport and the environment, and their connection with agricultural development in Europe, European Commission, Joint Research Centre, Institute for Energy and Transport (http://www.europarl.europa.eu/RegData/etudes/STUD/2015/513991/IPOL_STU%282015%29513991_EN.pdf) accessed 30 July 2015. For references, please go to https://www.eea.europa.eu/themes/climate/trends-and-projections-in-europe/trends-and-projections-in-europe-2016/4-progress-of-the-european or scan the QR code.